Smooth, rich, creamy...and sugar-free! 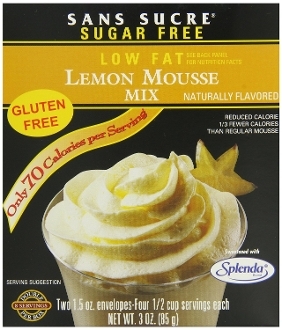 We say "enjoy the guilt"...and you can, with our Lemon Mousse Mix, now sweetened with SPLENDA. Sans Sucre Mousse is also low-fat, low-cholesterol, and contains just 50 to 70 calories per serving. Each gourmet flavor is produced with the finest domestic and imported ingredients...quality that is apparent in every delicious spoonful. No cooking required; simply add skim milk, chill, and serve. It's so easy, you'll love using it to create luscious pies, tarts, parfaits...an array of gourmet desserts!